Portuguese coast is more than 700km long and full of amazing surf spots, so it’s really easy to find ideal places for all levels of surfing with variety of breaks, cool atmosphere, good vibrations, beautiful nature and, of course, incredible ocean waves for surfing. That’s why Portugal is concidered as one of the best surf destinations all over the world. It has a great diversity of surf spots which are pretty unique, places to surf for beginners and professionals. In Portugal, you can enjoy surfing in the north , in the central part and the south of Portugal, areas full of great surfspots for beginners, advanced and profesional surfers. 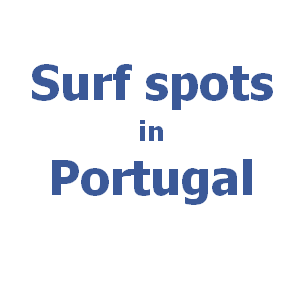 Read the surf spot guide written by surfers and enjoy information about top Portuguese surf spots for surfing in Portugal. You can find the World Class waves in Peniche or Ericeira, which is also the first World Surfing Reserve situated in Europe. The world record in the biggest wave ever surfed has been recognised on the beach Praia do Norte in Nazaré. The longest right-hand wave break in Europe has been seen the surf spot on Praia da Buraco in Figueira da Foz. Besides, there are many other amazing surf places with specific characters of waves. Here you can find the information about the surf spots all along the Portuguese coast from north to south. Moreover, you can read about the Surf characteristics of each place as, for instance, the best swells, winds or the best time of the year to surf. Choose your favorite surf spot in Portugal for your surf trip and enjoy the best places to surf with free online surf spot guide designed for mobile phones.